That the Orthodox Church has been in North America for two hundred years comes as a surprise to most people in the United States and Canada. Everyone knows, after all, that the Eastern Orthodox form immigrant communities, with their roots and identities in Central and Eastern Europe and the Middle East. In fact, the year 1994 marked the two hundredth anniversary of the Orthodox faith in North America. Those who paid any attention to the observance of this bicentennial know the story well. In 1794 Orthodox missionaries, sent by the Russian Orthodox Church, landed on Kodiak Island off the Alaskan mainland, after a long and arduous land and sea journey of 293 days. Their missionary work in what was then Russian Alaska began the evangelization of native people of Alaska. To this day, in some areas of Orthodox missionary activity in Alaska, the predominant Christian presence is that of the Orthodox Church in America’s Alaskan diocese. The Alaska of today gives evidence of another dimension of contemporary Orthodox witness. A parish community in Eagle River, near Anchorage, came to the Orthodox faith from evangelical Protestantism. A journey of several decades brought approximately two thousand people—including the Eagle River congregation—from the Campus Crusade for Christ to the Orthodox Church. The reading and study of the Bible and early Christian texts led these twentieth-century evangelical Protestant pilgrims and seekers first to call themselves the “Evangelical Orthodox Church,” and then, in 1987, to be joined to the historic Orthodox Church by the Antiochian Orthodox Christian Archdiocese. The history and staying-power, as well as the promise and possibilities, of the Orthodox Church in North America are well-represented by the Alaskan native parishes and by the former evangelical Protestants who are now Orthodox parishioners in Eagle River, Alaska. It is true that the stereotyping of the Orthodox Church as ingrown ethnic communities and of the Orthodox faith as a matter of “ancient and colorful rites” is powerful and persistent. It is also true that the Orthodox communities often enough project precisely what encourages such stereotyping. Still, all simplistic reductionisms are misleading and inaccurate. The reality of Orthodox life in North America is complex, and sometimes contradictory. Stereotyping of any kind only distorts this complex and contradictory reality. 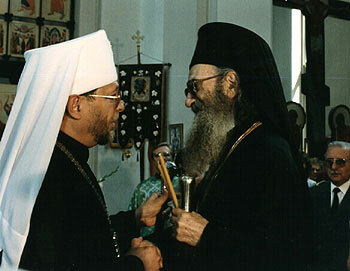 Metropolitan Theodosius welcomes Ecumenical Patriarch Dimitrios at St. Nicholas Cathedral, Washington, DC, 1990. Take, for example, the “ethnic” and “immigrant” dimension of Orthodoxy in the United States and Canada. Far from being a characteristically Orthodox phenomenon, this is an essentially American and Canadian phenomenon. After all, the predominant demographic feature and historic development of American and Canadian societies is to be found in the immigrant streams which have brought millions of people to North America. Here they have made new lives, found new homes, and forged new American and Canadian identities. Yet, they have also brought with them their old cultural, national, and religious identities. The communities they have formed reflect both the old and the new, in a living and organic interrelationship. Furthermore, the appeal of Orthodoxy to those who do not come from Orthodox ancestry, and who do not have roots in the Middle East or Central and Eastern Europe, is not limited to such movements as the evangelical Orthodox. In virtually every Orthodox community and institution there are men and women who have become part of its life because they have consciously made a “faith decision,” and this decision has brought them into the Orthodox Church. This is true across the spectrum, from a Greek Orthodox parish on Long Island, New York, to a Romanian Orthodox monastery in Pennsylvania, to a Serbian Orthodox Cathedral in Chicago, to an Antiochian (Arabic) Orthodox parish in California. You will find this to be the case in numerous “ethnic” communities, whether Albanian or Ukrainian, Bulgarian or Carpatho-Russian. 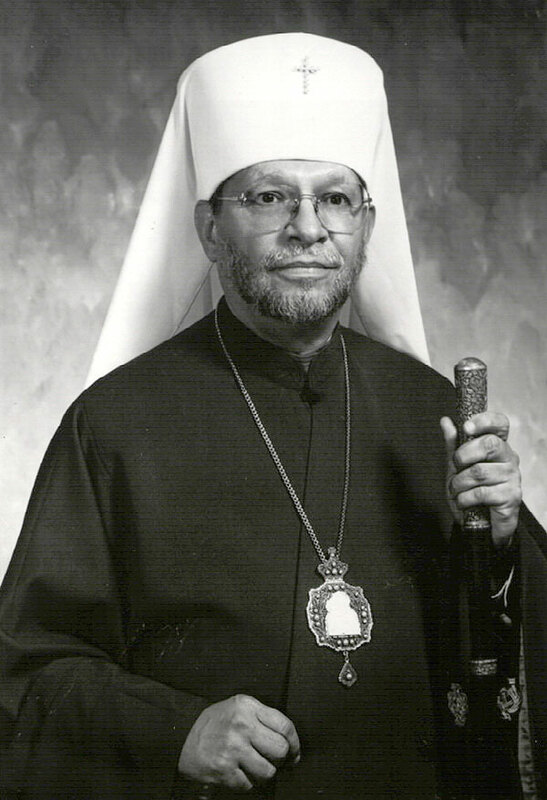 Metropolitan Theodosius (Lazor), Primate of the Orthodox Church in America, 1977-2002. The Orthodox Church in America is a useful case study of the present situation of Orthodoxy in North America. It is most closely identified with the history of the evangelization of the native peoples of Alaska, seeing itself in direct continuity with the missionary work done in Alaska since 1794. It dedicated itself to a church-wide celebration of the Bicentennial of Orthodoxy in North America in 1993-1994. It has evolved, during a two-hundred year history, from mission, to missionary diocese, to archdiocese (led by an archbishop and several auxiliary bishops), to a metropolitanate (with a metropolitan-archbishop as primate and several diocesan bishops), to self-governing (the technical term is autocephalous) church. Today, the ten-member Holy Synod of Bishops of the Orthodox Church in America includes five bishops who came to the Orthodox faith from other religious backgrounds, and seven of the bishops, including the primate of the church, are American- or Canadian-born. In each of the church’s three seminaries—St Tikhon’s in Pennsylvania, St Herman’s in Alaska, and St Vladimir’s in New York—students and faculty include significant numbers of men and women from religious backgrounds other than Orthodox Christian. At St Vladimir’s Seminary for a number of years approximately one-half the students (the total student body fluctuates from 70 to 100) in any given year are relatively new members of the Orthodox Church, or in any case joined the Orthodox Church as adults. The church-wide councils of the Orthodox Church in America provide a revealing profile of the church on a regular basis. Some four hundred clergy and lay delegates and all of the church’s bishops participate. The councils are thus a true cross-section of the Church. Today, the councils of the Orthodox Church in America are conducted in English. Among the delegates are members of numerous ethnic groups. Albanian, Bulgarian, and Romanian dioceses are represented. Although the sessions and services take place in a hotel, virtually everyone receives holy communion. The councils of the 1980’s concentrated on the church’s calling to be apostolic, to witness to the Gospel of Christ; the council themes were mission, evangelization, church growth. The councils of the 1990s are dealing with efforts to equip the church for its apostolic ministry and mission. This illustrates that change has occurred and is occurring, and the direction of this change is clear. There has been a eucharistic renewal; the eucharist and liturgical worship are seen to be at the heart of the church’s life and witness. There has been a conscious, and also organic, turning towards witness within the broader society. And in the Church’s membership—particularly among its clergy and lay leaders—the proportion of those who came to Orthodoxy from other religious backgrounds has risen dramatically. At one of the councils, in a workshop attended by some one hundred fifty people, someone asked how many of those present had converted to the Orthodox faith. More than half of the participants raised their hands—bishops, priests, deacons, and laity alike. Ecumenical Patriarch Bartholomew receives OCA delegates - (from left to right) Fr. Leonid Kishkovsky, Metropolitan Theodosius, Archbishop Peter (L’Huillier) of New York and New Jersey, Professor John Erickson - at the Phanar, December 1992. This brief look at the changes which have occurred during some thirty years is important, because Orthodoxy in North America is not often seen in this light. For many members of Orthodox communities, and for the U.S. and Canadian publics, “ethnic and immigrant” is still assumed to be a fully adequate description of the Orthodox Church in North America. Some think this is good, and others think it is bad. Obviously, the reality is more complex. There is clear evidence of a certain engagement with the larger society. The Orthodox faith clearly has drawing power outside the immigrant and ethnic context. There is a dynamism and a vitality in the Orthodox community, whether within the ethnic North American context, or in the larger context of the U.S. and Canadian religious, racial, and ethnic pluralism. Yet it is also true that all is not well with Orthodoxy in North America. The Orthodox view and the Orthodox voice are often not projected in a way that engages contemporary civilization, its hopes, failures, and illusions. Too often, the Orthodox witness is about Orthodoxy in its specificity—doctrinal, liturgical, iconographic, sacramental, ecclesiological—rather than about God’s love, God’s truth, God’s salvation and judgment and mercy. In other terms, Orthodox doctrine, liturgy, iconography, sacraments, and ecclesiology ought to be expressions of the way to salvation, and are not ends in themselves. While attracting new adherents to itself, the Orthodox faith in North America is also losing people. Young people often depart from the Church, some of them never to return. Among the millions of unchurched Americans who identify themselves as Christians, there is certainly a contingent of unchurched Orthodox. Among both laity and clergy in the Roman Catholic and Protestant churches, and in other religious groups and communities, one certainly finds those who converted from Orthodoxy. Furthermore, the turn towards the language of mission, evangelism, and church growth has not necessarily resulted in an organizational capacity to deliver on these concepts. Conversion to Orthodoxy more often than not is the result of a long and arduous personal search, a search in which the Orthodox may or may not be particularly helpful or open to seekers. Finally, while it is true that the Orthodox churches in North America are one in faith and doctrine, in sacraments, in moral teaching, they are divided in administrative terms, existing in separate “jurisdictions” which often look to different centers of ecclesiastical authority. Until the 1920s it was not so. The story is told in this book. The Church of Russia, extending its ministry to the whole North American continent after the sale of Alaska to the United States in 1867, provided a hierarchic structure through bishops it assigned to the North American diocese. The first bishops were Russians, then at the beginning of the 20th century an Arabic bishop was consecrated to minister to Arab Orthodox coming from the Middle East, and the plan was to provide bishops for the Serbian community, the Greek community, and so on. This pattern of development, it was anticipated, would lead to a united, culturally and linguistically pluralistic, Orthodox Church in America. It was not to be. The communist revolution, and the subsequent establishment of the communist regime in the Soviet Union, sundered the living connections between the Church of Russia and the Orthodox of North America. Beginning in the 1920s, one by one the ethnic immigrant groups, looking to their “mother churches” in the Middle East and Eastern Europe, established their own church administrations. The church body which saw itself as part of the Russian Orthodox Church separated itself formally in 1924, pointing to the impossibility of reliable relationships and communications with a Church in Russia undergoing intense and violent persecution. Thus even the Russian Orthodox Greek Catholic Church of North America—the so-called “Metropolia”—had to enter new and uncharted terrain. When in 1970 the Patriarchate of Moscow granted the status of autocephaly to this “daughter church,” there were those who feared and those who hoped for energetic movement towards a united and self-governing Orthodoxy in North America. Indeed the newly-named Orthodox Church in America did create a multi-lingual and multi-ethnic body, and invited all Orthodox churches to work together towards a full expression of Orthodox unity. This, too, was not to be. Ecumenical Patriarch Athenagoras rejected the autocephaly granted by the Moscow Patriarchate to the Orthodox Church in America. But amid the tensions and controversies, eucharistic communion was not, in fact, broken, although at one point it was announced that “koinonia” with the Orthodox Church in America was interrupted. The Orthodox Church in America consistently took the position that it is self-governing, that it is fully committed to a truly united Orthodox Church in North America, in which all the “jurisdictions” come together, and that it looks to the Patriarchate of Constantinople and the other “mother churches” for leadership in bringing about a proper, united Orthodox Church order. For twenty years there were no official contacts between the Patriarchate of Constantinople and the Orthodox Church in America. In North America, not without some stress and strain, the structures of unity represented by the Standing Conference of Canonical Orthodox Bishops in the Americas (SCOBA) were at least kept alive—sometimes barely so. It was in February 1990 that the first delegation of Orthodox Church in America was invited to come to the headquarters of the Ecumenical Patriarch at the Phanar, in the great city founded by Constantine the Great, Constantinople, called Istanbul in today’s Turkey. The conversations marked the beginning of a serious effort to explore and to understand the current church situation in North America, and the possibilities for mutual understanding. It was agreed that twenty years with no conversations and no official exchanges of views had been twenty years lost. It should be noted that a visit to the Patriarchate of Constantinople is a moving and emotional experience for any Orthodox. There is a nobility and heroism to the faithful endurance of the Ecumenical Patriarch, the metropolitans of his synod, and the clergy and laity of the dwindling Greek Orthodox community in Turkey. The growing strength of Islamic fundamentalism in Turkey provides manifestations of hostility to the presence of Christians in their midst. It is particularly difficult, yet tragically inspiring, to stand in the great church of Hagia Sophia. After the Turkish conquest of Constantinople, the church was turned into a mosque. Then, in the 20th century, it became a museum, a historical monument. This was certainly a glorious setting for the liturgical worship of the Orthodox Church from its consecration on Christmas Day, 537, until the fall of Constantinople on May 29, 1453. One can imagine what the envoys of Great Prince Vladimir of Kiev meant when, according to the Primary Chronicle, they gave an account of their visit to Hagia Sophia: “They led us to the edifices where they worship their God, and we knew not whether we were in heaven, or on earth. For on earth there is no such splendour or such beauty, and we are at a loss how to describe it. We only know that there God dwells among men.” Today, there is something of the quality of the witness of the “humiliated Christ” in the witness of the Orthodox Christians in contemporary Istanbul. The visit of Patriarch Dimitrios in 1990 brought together not only the Greek Orthodox, and the others (Carpatho-Russian and Ukrainian) belonging to his Patriarchate; it served to give all Orthodox a sense of unity. Every Orthodox was able to see in this venerable figure a spiritual leader who belonged to all. The same thing happened in November 1991, during the visit of Patriarch Aleksy II of Moscow. Coming as a guest of the Orthodox Church in America at the invitation of Metropolitan Theodosius, Patriarch Aleksy made a strong impression in his encounters with political and business leaders, with leaders of Christian churches and of other religious communities. An especially great impact of his journey to America was a growing sense among the Orthodox that they belong together in a way transcending differences in ethnic and national background and church jurisdiction. This was particularly evident in his meeting over dinner with all the Orthodox bishops, and in an open dialogue with clergy of the New York metropolitan area. In no other country during this century was the Church subject to such long and terrible persecutions and so many outward limitations as it was in Russia. Millions of people were brought up without God, without faith, and often without love. ... Communism brought about a major crisis. People lost the simple habit of being good to others. ... And it is only now that our Church and society have the possibility for renewal. Thus the message of Patriarch Aleksy was about the relevance and responsibility of the Orthodox Church in the great issues of human society. In October 1992 the visit of Patriarch Pavle of Serbia underscored yet again that the leader of one Orthodox Church is, in a sense, a leader who belongs to all Orthodox. This was very evident in the gathering of people from all jurisdictions in Chicago to greet the Patriarch of Serbia. In September 1993 Patriarch Aleksy of Moscow returned to the United States. This time he came from west to east, touching down first in Alaska. The purpose of this journey was symbolically to repeat the journey of the original Russian Orthodox missionaries, who started out for Alaska in 1793. In this way, the Russian Orthodox patriarch participated in the inauguration of the Bicentennial of Orthodoxy in North America observed by the Orthodox Church in America. On September 28 the patriarch broke off his visit to the Orthodox Church in America. He had decided to return to Moscow because of the confrontation between the President of Russia and its parliament, which was threatening to become violent. Upon returning to Moscow, Patriarch Aleksy was accepted as a mediator between the two opposing sides. The Patriarch was the only personality, and the Russian Orthodox Church was the only institution, acceptable to the two sides in a mediation role. Although the mediation effort failed, and violence broke out on October 3, it is highly significant that a peaceful solution to the conflict could be undertaken only by the Church of Russia—a historic reminder of the relevance and responsibility of the Orthodox Church in the great issues of human society. 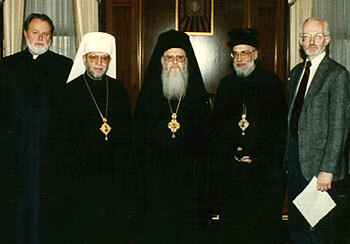 During the early 1990s, even as the leaders of the Churches of Constantinople, Moscow, and Serbia gave encouragement to a sense of common purpose among the Orthodox in America, the Orthodox jurisdictions moved forward with surprising energy to create institutions for working together on humanitarian and mission issues. The first was International Orthodox Christian Charities (IOCC) in 1992. In the aftermath of the collapse of the communist system in Central and Eastern Europe, the social and economic dislocation was manifestly evident. In some of the post-communist societies the Orthodox Church was the pre-eminent religious body. Indeed, in many countries the Orthodox Church is the largest non-governmental institution. (This is so in Russia, Ukraine, and Belarus, in Moldova and Georgia, in Serbia, Montenegro, and Macedonia, in Romania and Bulgaria.) With the international community, both governmental and non-governmental, trying to respond to the acute human needs in post-communist Europe, the Orthodox in America were eager to rise to the challenge, and to offer assistance and support. With energetic and visionary lay leadership in the forefront, the Standing Conference of Canonical Orthodox Bishops in the Americas (SCOBA) was presented a plan for the establishment of an inter-Orthodox humanitarian organization. The organization, professional from the very beginning, hit the ground running. Offices and projects were quickly established, with the head office located in Baltimore, Maryland, and field offices opened, one by one, in Moscow, Tbilisi, and Belgrade. The projected development of the organization will take it into Albania, the Middle East, and Armenia. IOCC has entered into cooperative ecumenical partnerships with the humanitarian programs of the World Council of Churches and the National Council of Churches of Christ in the U.S.A., with confessional humanitarian agencies, and with the Orthodox Churches in the regions where work is established or projected. The most urgent projects, ones confronted by massive human need and suffering, are in the Caucasus region of Russia (as a result of the war in Chechnya) and in Bosnia-Herzegovina (as a result of the wars in the former Yugoslavia). The second inter-Orthodox institution created by decision of SCOBA is the Orthodox Christian Mission Center (OCMC). Established on the foundation of the strong and well-developed Greek Orthodox Mission Board, the OCMC is pulling together personnel and resources from the various Orthodox jurisdictions in order to serve a commonly-affirmed vision of Orthodox foreign mission. Projects and partnerships are being nourished in Africa and Asia, in Central and Eastern Europe, and in the Middle East. In the context of the early 1990s, with visible signs and concrete actions manifesting energetic movement towards Orthodox unity in North America, two speeches at the Clergy-Laity Congress of the Greek Orthodox Archdiocese in July 1994 acquired a special significance and resonance. The city was Chicago. The Congress event was the concluding Grand Banquet. The representative of Ecumenical Patriarch Bartholomew to the Clergy-Laity Congress addressed some two thousand participants. “There is nothing wrong in preserving our cultural identity,” said His Eminence, Metropolitan Spyridon of Italy, but nationalism as a “destructive politics of identity” was named as a “terrible disease.” Not only was this disease named, but its results were also identified. “This disease fragments our Church, wastes our resources, and weakens our voice in the international community.” Metropolitan Spyridon went on to affirm the key element in the journey to unity. First, the sharing of the chalice of Holy Communion. Second, the building up of episcopal unity and co-operation through the Standing Conference of Canonical Bishops in the Americas. Third, coming together and working together through such organizations as IOCC. In such ways, united, ecumenical Orthodoxy moves forward. Those who were present bear witness that this was an electrifying and inspiring moment. The messages of the two metropolitans brought the assembled clergy and laity to their feet in a standing ovation. A historic meeting of the Orthodox bishops in North America November 30—December 1, 1994, gathered together the movement to unity in a focused, visionary way. Twenty-nine bishops met for two days at the Antiochian Village, in Ligonier, Pennsylvania, under the chairmanship of Archbishop Iakovos. The host was Metropolitan Philip of the Antiochian Orthodox Christian Archdiocese. There were papers and responses, as well as active, engaged dialogue in plenary sessions dedicated to two main themes: 1) the State of the Church in North America; 2) Mission and Evangelism. The bishops encouraged unity at regional and local levels, praising the structures, organizations, and models of unity which already exist, and offering a living foundation on which to build. The Ligonier conference was certainly the fruit of a two-hundred year history. It testified to decades of effort towards unity. It was also a miracle. No one could or did predict that such unity and clarity of vision would be so unapologetically articulated. Given all the developments described above, from the visit of Patriarch Dimitrios in 1990 to the address of Metropolitan Spyridon and Metropolitan Theodosius in 1994, it was startling and puzzling that the Church of Constantinople immediately rejected the Ligonier conference and its statements. It could certainly be anticipated that Constantinople and other churches would raise some questions and ask for some authoritative interpretations. No one at Ligonier imagined that there would be a rapid achievement of administrative unity. That would have been naive. Nevertheless, the Ligonier statements represented a realistic hope that the way forward was not only envisioned, but had also been charted, and that the Orthodox of North America would walk this road purposefully and united, supported and affirmed by the patriarchates and “mother churches,” on the one hand, and challenged and corrected by them, on the other. In the aftermath of the Ligonier conference, as the Orthodox Church in America prepared for its next Council of bishops and clergy and lay delegates in July of 1995, the thoughts of many in the OCA turned to 1970. It was in 1970 that the Russian Orthodox Church granted autocephaly to its “daughter church” in America. The year 1995 thus marks the twenty-fifth anniversary of autocephaly. Such understanding, affirmation, and guidance must be sought patiently and persistently. On May 4, 1995, the member hierarchs of the Standing Conference of Bishops met in regular session in New York City, under the chairmanship of Archbishop Iakovos. Soberly they reviewed the events of Ligonier in the light of the rejection of the conference by the Patriarchate of Constantinople. And they expressed their determination to stay together, to explain to the “mother churches” the true meaning of the Ligonier statements. The concluding passage in the Statement on Mission and Evangelization, adopted at Ligonier, Pennsylvania, on December 1, 1994 by the Conference of Bishops, is a fitting “mission statement” for the period ahead. We Orthodox in North America commit ourselves to bringing our household into order for the sake of the preaching of the Good News of Jesus Christ…and His Presence in the Church through the descent of the Holy Spirit.